Yesterday I ran across the relatively new (but already with 12 million users) social media site Pinterest. It is very visually based and seems perfect for AFOLs - kind of a mix of Facebook and Flickr. You can set your own site up with different bulletin boards (either from a list of theirs or defined by you) and then you 'pin' items (emphasis on images) to the boards via a very quick automated function you can add to your browser (there's an app for it as well, but I haven't tried that out yet). These could be your own images or just stuff you find interesting as you surf about - when you pin something it automatically includes a link back to the original location. Anyway, here's my Pinterest boards so you can see what I mean. 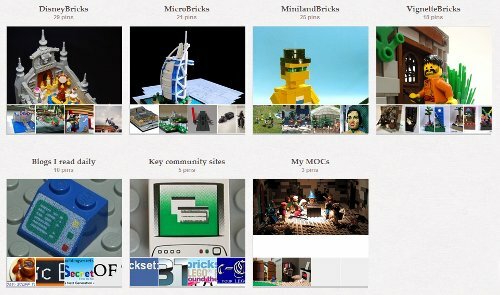 I set mine up so I have different boards for recent content from my different blogs, and also to my MOCs and my favorite sites. 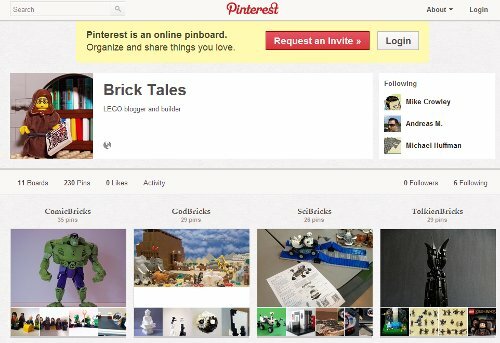 I have been on for a little while (http://pinterest.com/tedward7/) but I am not terribly impressed. It is too random for my taste and does not provide the organizational tools and discussion forums of Flickr Groups. I hope that Flickr can recover from it's current state (see: http://gizmodo.com/5910223) but it is still a better service. I find Pinterest a place I use to "bookmark" things. For me it is replacing the cumbersome Google Boookmarks which never worked well. This looks really interesting -- I'll check it out. Thanks for posting.